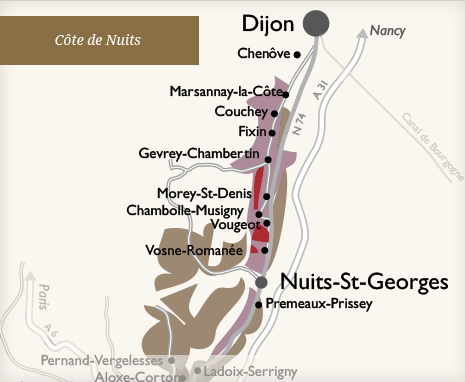 Formerly dependent on the Cîteaux Abbey, the small village of Chambolle-Musigny is located at the heart of the Côte de Nuits, between Vougeot and Morey-Saint-Denis. Soil The vineyard is located on the east and southeast-facing slopes of Chambolle-Musigny where the soil is brown limestone based. Grape variety 100 % Pinot Noir. Vinification Vinification takes place in temperature-controlled open vats (28/30°C) with regular punching of the cap followed by 12 to 14 months ageing in oak barrels with a maximum of 15% new oak. Robe Attractive ruby red with cherry coloured highlights. Nose Empyreumatic, toasted notes with predominant red berry aromas and a delicate touch of spice (cinnamon, a hint of saffron). Palate Boasting lovely density, this is a structured wine with soft, velvety mouthfeel. Serve with Pair this wine with finely prepared choice cuts of red meat and mild cheeses. It would be perfect with leg of lamb with figs or beef tenderloin with caramelized red onions. As for cheeses, try it with perfectly ripened Reblochon or Brie de Meaux. Serve at 15 to 16 °C. Cellaring potential From 5 to 7 years.